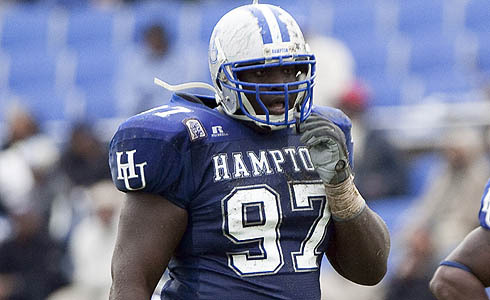 Aaron Wilson of the National Football Post reports Hampton defensive lineman Kenrick Ellis is drawing serious interest from several NFL teams, including the Steelers, Eagles, Broncos, and the Packers, according to league sources with knowledge of the situation. The 6-foot-5, 346-pounder has drawn second-round grades from several draft analysts. Per a source, Ellis interviewed well at the NFL scouting combine and was accountable for past transgressions that got him dismissed from South Carolina (reportedly failed drug tests) before transferring to Hampton and being suspended for one game. Ellis addressed the off-field problems at the NFL scouting combine during an interview with a crowd of media. “I had character issues,” he acknowledged. “I had disciplinary problems. They did everything they could. It just didn’t work out for me. I had to get out of there.